HÀ NỘI — Deputy Prime Minister Trương Hòa Bình has ordered the Ministry of Transport to instruct the Directorate for Roads of Việt Nam and Việt Nam Railway Authority to work with agencies in provinces and cities that the railway runs through to increase safety. Bình, who also heads the National Traffic Safety Committee, requested that the agencies enhance dissemination information on ensuring safety at level crossings for road users. It is necessary to appoint guards at crossings that have a high rate of vehicles crossing them as well as places that accidents occur regularly, he said. He asked the Ministry of Public Security to work with police in localities to reinforce patrols and deal with violations, especially the illegal lifting of barriers. 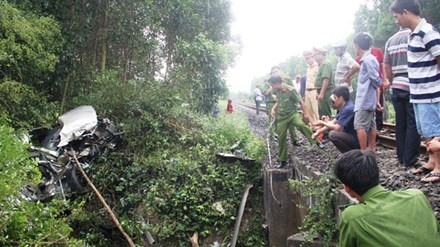 His order came after a north-south train crashed into a seven-seater car at a rail crossing in a residential area in the southern province of Bình Định’s Tuy Phước District on April 24. The accident left four people dead and two injured. Bình ordered the People’s Committee of Bình Định Province to identify the cause of this accident and determine the responsibility of individuals and organisations involved, he said.